Broken Indian EP from evilhero arrived with no frills and no press release. 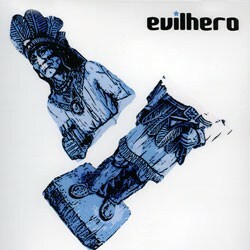 A quick online search revealed the lack of verbiage to be purposeful; the longest available description of the group reads: “evilhero is an original rock band based in Vermont.” It seems that while many bands prefer to put a PR spin on their sound, evilhero wants the music to speak for itself. Lucky for them, it does. For the most part. I was not immediately sold on this disc. The first two tracks, “I Can’t” and “Smorg,” while well executed in a roots-rock style, failed to really hold my attention at first listen. Slightly disappointed, I skipped ahead to the start of track 3, where things began to look up. By far the album’s standout track, “Rubberneck Row” is a reflective ballad of loss, with a distinctive climax and resolution. I found myself listening to the lyrics earnestly, hoping to learn the words so I could wail alongside singer Ian Ferris. Now officially won over, I returned to the beginning and gave the boys a second shot. This time around, I found the tracks to have a similar “groove” effect. I realized that my original lack of interest likely stemmed from the fact that, much like their press kit — or lack thereof — evilhero’s sound comes sans frills. The instrumentation is clean but not overly intricate. Multitracked vocal harmonies blend perfectly; you have to consciously listen to even notice them. And the lyrics, though by no means catchy, are well composed. Broken Indian EP’s first four tracks were recorded at Stillwater Studios. But the final two, “Snakes” and “Stumble & Mumble,” are live songs from a June 18 Higher Ground performance. These take a turn toward the jammy — and a little less my cup of tea. It is great to hear that the group’s instrumental talent is not limited to the studio. But I was disappointed by the comparative lack of vocals. In the end, I appreciated evilhero’s six-track offering. With so many bands in today’s scene described as alt-this or indie-that, it is refreshing to sit back and listen to a rock band with no pretenses. These guys are not out to win any indie street cred — which is good, because they won’t. But judging from the strength of Broken Indian EP, they will rock to their full potential and give a solid performance — one you can catch live this Friday at 242 Main.